The day you started in communications was the day you became a member of the ethics committee and you joined the brand police force. In public relations, it’s your job to uphold the integrity of the brand and ensure the messaging is consistent and remains intact across all communications channels. Now, with social media, your messages go further and you cast a wider net; your company is automatically in the center of public conversations and in the critical eye of the consumer. 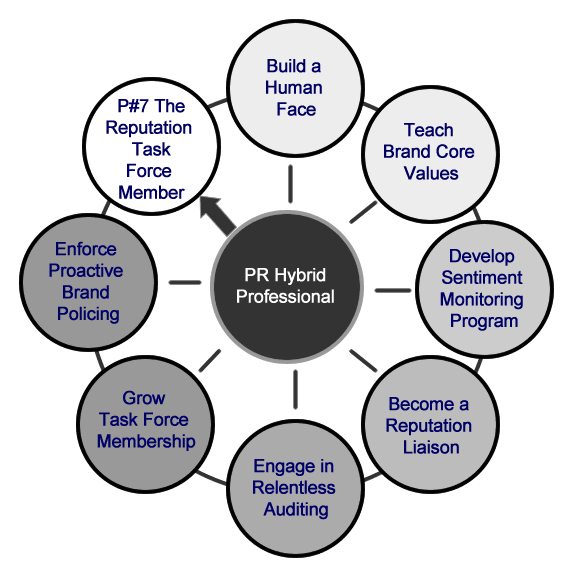 In my book, Social Media and Public Relations: Eight New Practices for the PR Professional, PR Practice #7 focuses on how PR professionals must concentrate more on reputation by building a human face, daily monitoring and more brand education for themselves and their peers. Today’s post is a part of the “edited” or “cut” chart series, which includes the Reputation Task Force Member’s Chart of Responsibilities. Even though you’ve always had the reputation of your brand front and center, social media increases your need to take a proactive approach on many fronts. Whether you realized it or not, being in the PR or communications means you an important part of an organically growing task force. I mentioned in my book how, “The Reputation Task Force Member is a natural position for the PR person who usually is immersed in the negative communications issues, the crisis situations or the damaged reputation … PR professionals also have the knowledge and skills to minimize or neutralize the critical issues or concerns.” You can see in the chart of responsibilities how human and transparent communication, increased brand education, a proactive approach to reputation and continued task force growth lead to communications success. Proactively protecting a reputation starts with the human face of the company. Anyone who has said social media requires transparency and open communication is 100% correct. People relate to people. We are social beings who want to connect and engage with other people in different ways. Your ability to interact and build strong relationships may directly correlate to the transparency and human side you show. Remember, consumers want to talk to people and not to logos. If you’re not directly involved in the creation of the brand communication guidelines, then you need to get involved! It’s really interesting to note that when an organization develops its brand style guidelines, there are areas dedicated to the communication and messaging, including voice, style and tone. Too often, PR people are not involved in the process. This is right up the PR person’s alley, as we are responsible for responding to the public through a variety of channels, whether it’s via the media or now directly to customers in our social networks. You don’t want to be setting up your sentiment monitoring program after you realize your customers are not speaking favorably on behalf of your brand. 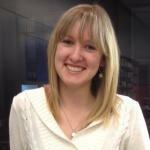 The time to think about sentiment monitoring is proactively beforehand and at the start of your social media planning. Determining the conversations to track and the keywords to monitor is critical to the success of your brand’s reputation. You have to know what you’re monitoring, how frequently it’s monitored and the best way to report on your findings. Social media turns the PR professional into a relentless auditor of social media for brand reputation. Of course, you were always reviewing news clippings and online coverage, making sure your companies, products/services and executives were represented in a favorable light. There were times when you were able to see a story before it went to print and then there were times you were chasing down an editor to get a retraction. Today, through social media monitoring tools you can take a proactive approach to reputation, saving precious time and resources by squashing issues early on and neutralizing negative comments before they have the chance to go viral. Being on the reputation task force alone could be a full time job, so it requires the help of your peers in your department, as well as those across the company. The overall goal of being a liaison and growing the task force team is to be able to better maintain the health and well being of the company’s reputation, in the age of public conversations. Seeing positive progress through the growth of your task force, and effective and positive sentiment monitoring / measurement, is an indication of “reputation wins.” Positive progress means the participating task force members (and reputation liaisons) have done a great job. 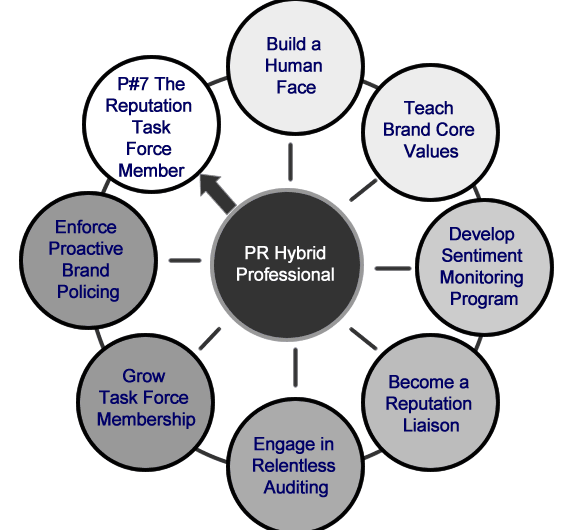 By growing the task force you will create an active force of brand police who naturally are watching, supporting and reporting on brand communications. Today, as a result of social media, they say every person in the company technically becomes a part of customer service. The same goes for the reputation task force members. Whether officially assigned or spearheaded as a grass roots effort, it takes an entire army of employee champions, on the brand police force, to guide and uphold the brand values and messaging. With your strong sense of ethics, your knowledge of the brand voice and your constant desire to be a part of the brand police, participating on the reputation task force is the best way to utilize your skills to maintain and often protect your brand’s reputation. 2 Responses to " PR Practice #7: Reputation Task Force Member Chart of Responsibilities "
If you want to monitor news, blogs, twitter, facebook, google+, youtube or any website you can use socialwatching.com. There’s an open search engine on search.socialwatching.com website.